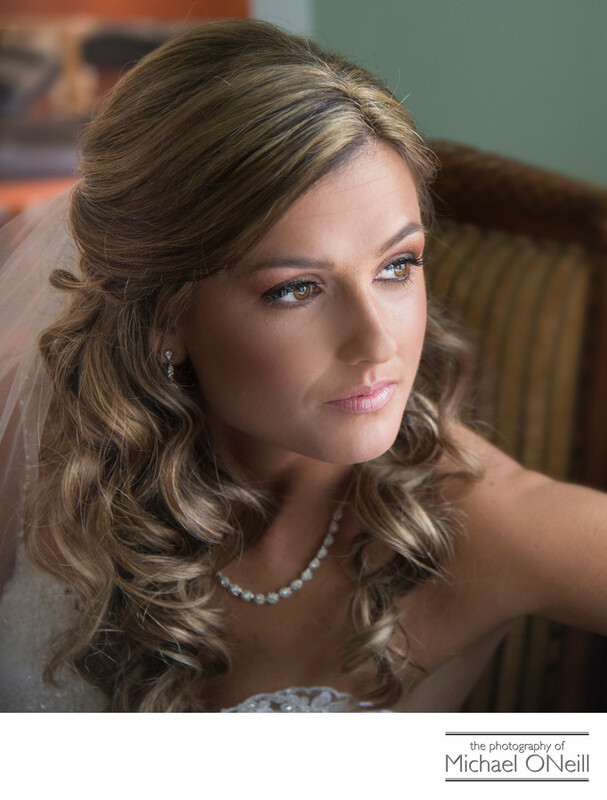 One of my most favorite parts of the wedding day is when I create beautiful and glamourous portraits of the bride. The intimacy of the close up portrait carries with it such personality...such insight into the emotional make up of the subject. They say "The Eyes Are The Window To The Soul" and I couldn’t agree more. I love creating these images early in the wedding day, preferably immediately after the bride has had her hair styled and makeup applied by skilled professionals. When I arrive at the bride’s place at this time on the wedding day I immediately scout out the perfect natural window light by which to create these images. Background is relatively unimportant. It is probably going to be rendered out of focus anyway. What is important is capturing my subject in the softest, most flattering, directional light to showcase her wedding dress, jewelry, headpiece...but most importantly, the softness of her complexion, the color and depth of her eyes and the subtle highlights in her hair. Capturing beauty is what I am all about and there is no day in a girl’s life when she is more beautiful and more radiant than her wedding day. Choose a professional wedding photographer who is as excited about your beauty as you are.